Start by warming your coconut milk, coconut cream, salt and sugar in a medium saucepan over medium low heat. Place your egg yolks in a medium sized bowl and set aside. While the mixture is heating, split your vanilla beans in half, lengthwise and scrape out the seeds. Place the beans and the seeds into the warming coconut milk. Once the mixture has started to bubble, turn off the heat and cover the saucepan. Let this sit for at least one hour so the vanilla beans can infuse the coconut milk. Remove the vanilla pods from the mixture and begin heating again over medium low heat. Once the mixture starts to bubble, slowly add ½ cup of the heated mixture into your egg yolks while stirring. Do this 2-3 times until the egg yolks are warm. Whisk the egg yolks into the saucepan and continue heating until the mixture thickens. Place into your refrigerator and let chill for at least four hours, or until the mixture has fully cooled. Heat the coconut milk, coconut cream, salt and sugar in a pan over medium low heat. Split the vanilla beans and scrape the seeds out. Place the pods and the seeds into the mixture heating in the saucepan. Once the mixture has just started to boil, turn the mixture off and cover with a lid. Remove the vanilla bean pods and set aside. Reheat the mixture, once warm, temper in the egg yolks. Continue cooking until the ice cream custard thickens. Remove from heat and let cool to room temperature then place in the refrigerator until completely cool. Finish in your ice cream machine. Cool the ice cream mixture quicker by putting the pan into a cold water bath. You can do this by taking a large bowl and filling it a quarter of the way with cold water then placing a couple of cups of ice into the water. Set a smaller bowl into the ice water and pour your ice cream custard into the bowl. Stir the mixture until it has cooled. 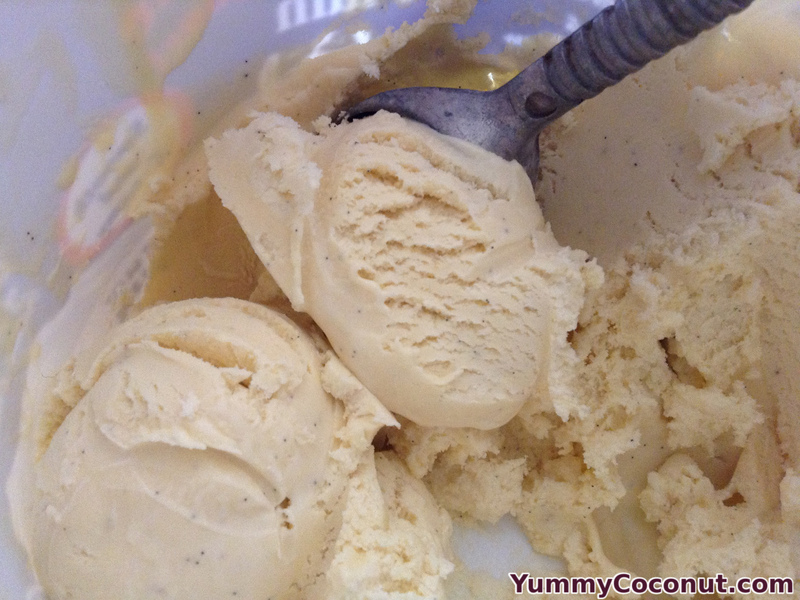 I recently made coconut cream Ice Cream, however I used coconut sugar to sweeten. It created a really caramel-y taste and sticks to the coconut theme. Very Yummy!